Survival City is a roguelike survival-strategy game where the player tries to lead a group of survivors towards the edge of the city. 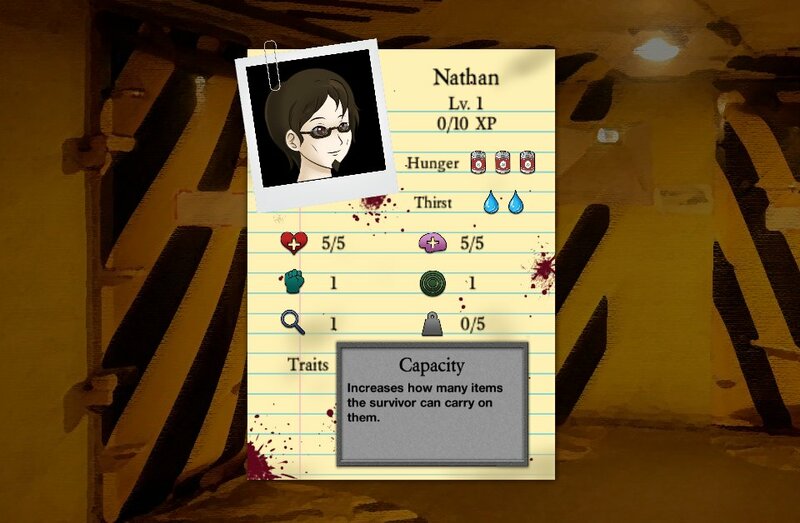 Survivors are randomly generated with two out of 75 different gameplay traits and one of 9 different personalities. Locations are searched for supplies but will sometimes have zombies. Events also randomly occur with choices with risks or rewards for the survivors. An ingame guide is provided detailing most of the gameplay mechanics. However, it should be noted that in order to fight zombies, a weapon needs to be equipped on a survivor. Otherwise, the only option is to run away (performed by pressing the left and right arrow keys repeatedly). Other than that, the game is about managing Health, Sanity, Hunger and Thirst for the survivors while they explore the city. The current game features no music and limited sound effects. I hope to launch a Kickstarter to both hire a composer, as well as an artist to replace my artwork to something more professional looking. Until then, most game mechanics should be functioning and playable.